Kodenkan Jujitsu is a martial arts system developed in Hawaii by a Japanese immigrant named Henry Seishiro Okazaki. The system is a composite of multiple different martial arts, including Kodokan Judo, Classical Japanese jujitsu, Hawaiian Lua, Shorin-ryu Karate, Eskrima, and Boxing. The basic curriculum educates students on proper falling technique, hold escapes, joint manipulations, throwing arts, ground fighting, chokes, strikes, and combination arts. It also includes a complete system of resuscitation, bodywork, and healing arts. Another name for the system is Danzan Ryu, which directly directly means “Hawaiian Style,” a clear reference to its origin in Hawaii. Danzan Ryu is one of the most comprehensive and most widely taught styles of Jujitsu in the United States. It can be learned by men, women, and children of all ages, and has been touted for its positive effects on personal growth and character development. 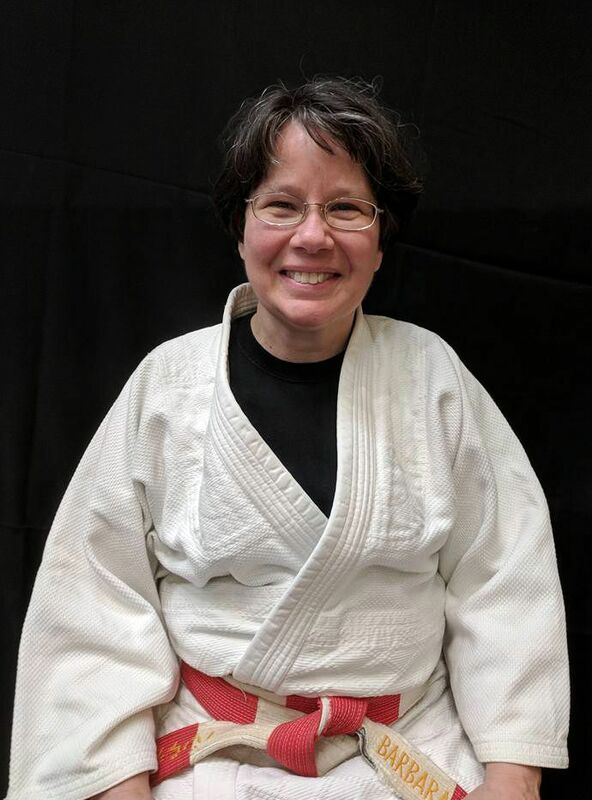 Professor Barbara Gessner, 7th degree blackbelt, in jujitsu, and 5th Degree blackbelt in judo, began studying the martial arts in 1972 at East Stroudsburg University, Pennsylvania, where she received both her bachelor’s and master’s degrees in Health and Physical Education. Her master’s thesis was an application of teaching methodology to the martial art of Jujitsu. In 1976 she took over her first dojo, Portland Kodenkan in Pennsylvania, and in 1978 she became sensei of Rutgers University Kodenkan in New Jersey, and has been hosting an annual weekend-long Regional Seminar there since 1980. She also received her Doctorate in Education from Rutgers. The first recipient of the Bert Aspinall Award, Barbara served on the AJJF Board of Managers and Operations Committee for over 20 years and later on the AJJF Council of Senior Instructors. Prior to that she spent eight years as Director of Clinics for Region IV (now the Northeast Region). In 2012 she was awarded the Professor Ray Law Award for outstanding children’s program. She was promoted to Professor at Ohana 2010 by Shoshin Ryu Yudanshakai and Pacific Jujitsu Alliance. At Ohana 2014, she was honored by the American Jujitsu Institute for over 40 years of dedication to the Kodenkan/Danzan Ryu System and promoted to the rank of Shichidan, 7th degree blackbelt. In conjunction with that promotion, Barbara also received commendations from the governors of both New Jersey and Pennsylvania. In addition to our head instructor, we have 5 other black belt with years of experience as teachers and students. The black belts take turns leading each class, ensuring that our students are learning from multiple different perspectives. Each black belt got started in the same place as our beginners and worked their way up the ranks. Rutgers Kodenkan Jujitsu is a sports club operating under Rutgers University in New Brunswick. It’s open to all students (undergraduate and gradute), faculty, and staff of Rutgers University. Anyone with a Rutgers Recreation Membership is also eligible to join. Yes! Everyone is free to join at any point during the semester. Our classes are normally divided up by skill level to ensure everyone is learning something new. We recommend wearing clothing that you feel comfortable moving in. Since our curriculum includes throwing and falling, we also recommend wearing pants rather than shorts. As we get into learning how to throw, we ask that you bring a long sleeve sweatshirt or hoodie that you don’t mind possibly stretching out. We also recommend you wear supportive underwear! If you wish to purchase a Judo Gi, the uniform we wear when working out, we sell them in various sizes at wholesale rates. They include the top, pants, and belt. Prices range from $30 to $40 depending on size. I already have a Gi, can I wear that? Yes, if you already have a uniform, you can wear it. However, please understand that we use Judo Gis specifically for their toughness when pulling or yanking. Traditional Karate or Taekwondo uniforms might be easier to tear or rip during our training sessions. How does the belt system work? Our belt ranks are separated into 2 categories: Kyus (colored belts) and Dans (black belts). You start at white belt, or 7th Kyu, and work your way up to 1st Dan, first degree black belt. After that, you can go all the way to 10th degree. Do I need to pay to take a belt test? No. We understand that other schools charge their students to take tests, but we don’t do that here. We also don’t charge you for the belt! You get that free once you pass! If you have Amazon Prime, 2 days. Joking aside, it takes however long it takes for each individual to meet the requirements. The fastest earner in our dojo did it in 4 years, but on average, it takes longer. All you have to do is show up and try. You’ll get there eventually. Do I need any prior experience? Nope. No previous martial arts or sports experience is necessary. In fact, many of our regular students didn’t have any prior experience before they first started. How much are club dues? Our club dues are only $15 per semester. You can try out a class for free to see if you like it. It’s a great deal considering the average membership cost at a traditional dojo. No. Our students have different priorities and responsibilities. Remember that you’re a student first, so your education should take priority. Missing a class every now and then won’t put you behind. We’ll start from where you left off the next time you show up to class. How is this different from Brazilian Jujitsu? Brazilian Jujitsu also focuses more on the sport aspect of the art whereas we focus more on the application of jujitsu in terms of self defense and conflict de-escalation. What do I need to do to get promoted in rank? There are 3 requirements that need to be met sequentially to receive a promotion in rank. Get approved to test in front of instructors and receive a passing score. Why do I need to write down the techniques? We require all our students to maintain and update their own notebook for jujitsu. This notebook should contain written descriptions of every technique the student has learned in addition to any supplementary notes they may find helpful. The reason for this is to reinforce student learning through writing and to help maintain consistency within the dojo. Evey notebook is checked prior to examination by a senior student who will offer suggestions and make corrections when needed. Having an updated notebook is also helpful if you take an extended break from practice and have trouble remembering how things are done. The notebook is a convenient quick reference guide for our students. Is there a list of all the techniques? Yes! Our examination form, which includes every technique needed through black belt, is available for download. The list might seem confusing at first since every technique is written in romanized Japanese, but you’ll get the hang of it quickly. Print out the list and bring it to class for a more thorough explanation. Drop by any of our sessions and get started right away! Click the button below to get a head start on our membership forms!